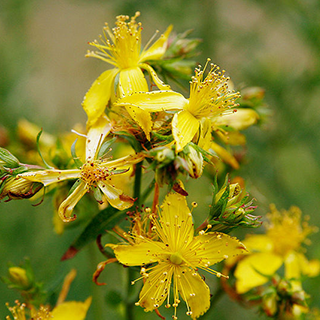 Native to temperate zones in Europe and Asia, St. John’s wort has been used as a wound herb since the Crusades, and was widely regarded as a cure-all in earlier centuries. It was also used for treating hysteria and mental illness. Today it is widely prescribed in parts of Europe for depression; the quality of commercial preparations, readily available to purchase, can vary. St. John's Wort has a deep seated nervine effect, helping restore damaged nerve tissue, deadening nerve pain and strengthening the urinary organs. The herb is very useful for treating athletic with nerve damage and/or pulled muscles or ligaments, also for improving quality of life for those suffering from chronic disease, including arthritis, multiple sclerosis and AIDS. "Hypericum" is a proven antidepressant that definitely helps raise the spirits. Make an infusion of 1 cup boiling water over 1–2 tsp (5–10ml) of the aerial parts. Drink 1 cup 3 times daily for anxiety, irritability, or emotional upsets associated with menopause or PMS. Take 40 drops–1 tsp (2–5ml) 3 times daily for nervous tension leading to exhaustion and depression. 5–10 drops of tincture at night can be useful for childhood bed-wetting. Use 1 cup of above infusion of aerial parts to bathe wounds, skin sores, or bruises. Apply a little oil 2–3 times daily to minor burns, sunburn, cuts, or scrapes. Massage gently to relieve inflamed joints and tendonitis, and to ease nerve pains. Up to 10 drops of lavender or yarrow essential oil with 1 tsp (5ml) of the oil increases efficacy. Prefers a sunny position and well-drained, alkaline soil. Sow seeds in seed trays in autumn or spring and pot when large enough to handle. Harden off before planting in final positions. Established clumps can be divided by root division in spring or autumn. Gather the whole plant just before flowering, or just the flowering tops in midsummer.